Happy Thursday! Today our spotlight of the week is spring blazers! I got this blazer a few years ago and I have worn it many times. I love pink and it is perfect for spring! Come share you spring blazers with Elle and I! 1. We kindly ask that you follow the two hosts: Elle from Living in Color Style and Jacqueline from Stylin' In St. Louis via Bloglovin or GFC, and of course, our co-host, Katie of All Glammed UP blog. Spotlight: Our spotlight this week is Chi Chi from Chi Chi Loves…! Chi Chi's dress is just fabulous for spring! She added the perfect pop of green! This look just screams spring! Be sure to check out her adorable blog! Next week: Next our spotlight weekly theme is Menswear Inspired. Thanks for linking up! See you next week! I love everything about this look! That top and jacket are both so beautiful! Love this look and especially the pink blazer! Thanks for hosting the link-up! Oh my! What a lovely mix of colors, shapes & prints.....& the pink lipstick as well!!! That floral print is so pretty! Love how you paired it with the pink blazer! Great colors and that drop waist top is so pretty. I love this! The pink and floral with the pop of teal is perfect! 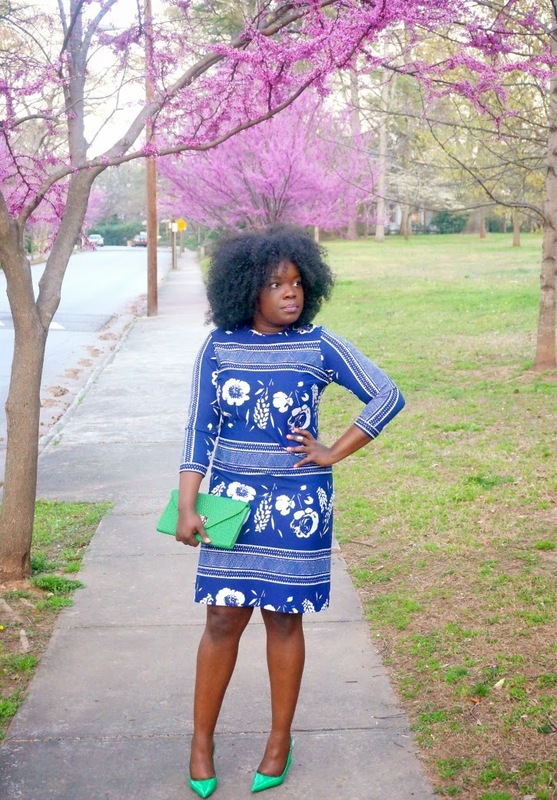 I absolutely love this outfit, your style, and your blog! Every outfit I have seen has been so inspiring! Love love love! I love your look! The necklace is really great. This outfit makes me so ready for spring! Love all the bright colors! You look so cute! I have been wanting to add a pink blazer to my wardrobe for awhile! Love love this look!! The pink blazer is so fun, and I love it with the floral top! You look adorable! I love this fresh, spring look! Your floral top is SO pretty! Love your bright colours! The hot pink and the necklace are so great together. love all the color here! the pink blazer is fabulous! absolutely loving all your bright colors! i just snagged that same blazer in mint but now you have me wishing i had grabbed it in pink as well! !